We offer an exquisite range of aluminum slugs that are fabricated using premium grade aluminum that cater to diverse packaging needs of various industries. Our fabricated slugs are produced in continuous cast line to avoid melt shrink defects, inclusions. The slugs are extruded to the requisite size, trimmed and annealed. With sincerity and hard work of our professionals, we have carved a niche for ourselves in this domain by providing premium quality gamut of Aluminum Slug. 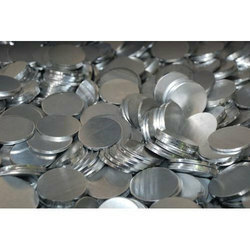 We can supply aluminium slugs of 99.7% Al purity from our aluminium rolling mill. Slugs from Diameter 20 mm to 116 mm can be supplied. The following are the different diameters that can be readily supplied. 20mm, 25 mm, 27mm, 40mm, 45 mm, 50 mm, 54 mm, 63.5 mm, 74 mm, 75 mm, 85 mm, 89 mm, 90 mm and, 116 mm. Slugs to customer's specifications can also be supplied. We offer quality Aluminum Slug to our client. Accurate chemical composition is used for the manufacturing of these products. Professionals ensure longer expiry and non toxicity of these products to let patrons have satisfaction. Aluminium Slugs Used to make Medicine Tubes. Shapes : Flat, Domed Conical, Domed Spherical. 20mm, 25 mm, 27mm, 40mm, 45 mm, 50 mm, 54 mm, 63.5 mm, 74 mm, 75 mm, 85 mm, 89 mm, 90 mm and, 116 mm. Slugs to customer's specifications can also be supplied. We can supply aluminium slugs of 99.7% Al purity from our aluminium rolling mill. Slugs from Diameter 20 mm to 116 mm can be supplied. 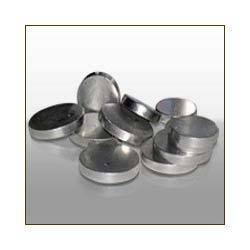 The following are the different diameters that can be readily supplied.